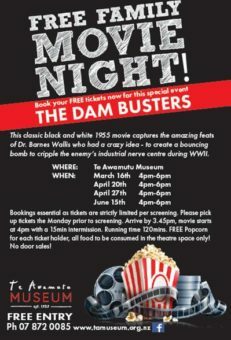 Family Movie Nights – The Dam Busters! Join the Museum team for a free movie night at the Museum! In conjunction with the Dambusters exhibition, we are proud to present four free community screenings of the 1955 classic, “The Dam Busters”. Tickets for each screening are strictly limited and must be booked and collected prior to the screening date. There is no charge for the event. Contact the Museum to book now!